The French-born artist who died in 2002 is perhaps best known for her large, brightly coloured sculptures of female figures, as well as her Shooting Paintings – done in the early 1960s with the help of Jasper Johns, Robert Rauschenberg and her second husband Jean Tinguely. However, her formative years were spent with her first husband, the writer Harry Mathews, between 1950 and 1960. 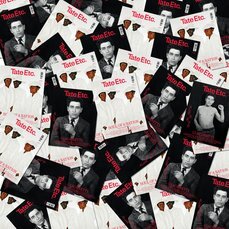 He talks about this time to Tate Etc. When did you meet Niki? I really met her twice. The first time was in 1944 (possibly 1943) when we were vacationing with our families in Stockbridge, Massachusetts. I was fourteen years old, Niki thirteen. She developed a crush on me because of my bow tie; I pretty much ignored her, being interested in older girls. As a result of this, whenever we met in New York on social occasions, she behaved rather coolly towards me, which perhaps should have irritated me, but didn’t. This all changed at our meeting in the autumn of 1948. I was travelling down to Princeton one Saturday for a football match, eating trout in the train dining car, when a svelte young woman walking past turned to say ‘Hello, Harry’, with a smile that illuminated her beautiful face to an extent that left me without breath or speech. A moment later, I went after her. Fortunately we were on a train – she could hardly escape. Can you say a little about what you and she were like; what kind of upbringings you had? Romance aside, one reason we were so drawn to one another was that we had had similar upbringings in genteel, moderately well-to-do families who subscribed (even though Niki’s was Roman Catholic) to the tenets of upper-class New York WASP society. These were far more conventional than they are now, smothering everything in propriety and respect for professional success. Niki and I were both artistically inclined, oversensitive, overtly rebellious romantics, and we bonded together as such. We began having an affair, which only heightened our impatience with the state of our lives and led, soon after I’d joined the navy for a year, to our elopement. What was it like living with Niki? It depended on circumstances. We were extraordinarily happy together for much of our ten years, but when she was ill with her nervous breakdown, and later thyroid trouble, life was a nightmare. Our last year was extremely painful. She was always highly sensitive and full of determined insight, but if this sometimes made her difficult, it was almost always to a productive end. You moved to Paris at an early stage in both of your careers. In what direction was Niki’s work going? That was in the early summer of 1952. As well as modelling for Vogue and Elle, Niki was studying to be an actress, and I to be a conductor. After her first round of studies, she had a promising career ahead of her. By the autumn of 1953, she had gone through and was emerging from a violent nervous breakdown, a terrible few months. We had entered into a period of infidelity and non-communication when we moved to Menton for the summer. Niki got to the point where she was devising one ingenious method of suicide after another. She became intermittently hysterical and virtually out of her mind. She was first treated with a series of electric shocks − a barbarous treatment, although I have to say it helped her. Afterwards she came into the hands of an excellent, humane psychiatrist, who in a month or two of narcoanalysis restored her to mental health. Between the shocks and the analysis she was put in a clinic, and there she began doing her first collages and soon after that her first paintings. They were extraordinarily original and compelling. In October or November, having given up all thoughts of a musical career, I followed her energetic example and began writing for the first time since 1949. Did you both have such a thing as a daily routine? Niki and I both followed a routine: we worked all day long. The difference between us was that I was hesitant and tentative, while she went flat out on one work after another. Did she talk about how she chose the materials for her collage pieces? Her first collages were made of twigs, grasses and pebbles that she picked up outside the clinic door where she was being treated in 1953. A couple of years later, she was very impressed by Gaudí’s broken-plate benches in the Parque Güell in Barcelona – hence, I imagine, the recurring appearance of plates in her own art. She even made a corner of the floor of one of our rooms from broken plates. 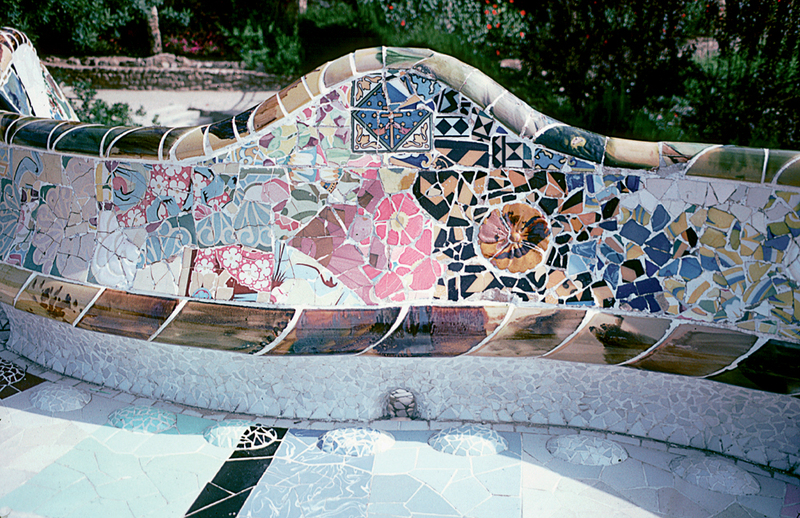 She would break dishes – though, unlike Gaudí, she would not match up the pieces. She was exuberant about his work. She had discovered someone whose sublime and beautiful work used forms in a way that no one else had. Niki was not an intellectual. When she found work she liked, she absorbed and devoured it; rather than analysing it rationally, she remained instinctive and developed her intuitions patiently and observantly. I don’t remember any other particular rules or habits that governed her gathering of found materials. She had definite penchants at different times – for example, children’s toys or sharp tools. Your son Philip, who was born in 1955, was ill for some periods in the late 1950s. How did you cope with family life at the time? Philip suffered from hypoglycaemic convulsions and comas, starting in the summer of 1957. It was a nightmarish time for all of us. Niki was still suffering horrendously from her hyperthyroid condition, which finally ended with an operation in early 1958. For a couple of years there wasn’t much possibility of finding time for work. It was a question of hanging on. I began The Conversions in December 1958 and finished the book in May 1960. Things by then were much improved: Niki was healthy again, Philip was getting better and we had moved from Paris to Lans-en-Vercors in the mountains south of Grenoble. We were happy enough for the first couple of years in our new mountain habitat. So conditions for writing my first novel were as good as could be wished for. Her health affected everything. Extreme hyperthyroidism is a very debilitating condition. One of its symptoms is tachycardia. Her heart rate could be as much as 160 beats per minute, which is incredibly high. It didn’t go down in the evenings, so she never slept for any length of time. It was tough – there were two invalids in the house. During all that period of illness I had to take over everything. I thus developed a habit of trying to run her life for her – something that, when she was healthy again, she didn’t need or like. The subsequent hostility towards men, and me, began expressing itself at this point, and it manifested itself in her work – the black landscapes, the collages with all the sharp ceramic fragments and metal tools. Portrait of a Woman 1958 is one of those strong images. What did she think about these earlier works? Niki called this painting Tormented Self-Portrait. It was done, I believe, when our marriage was starting to sour: it’s more a transitional than an early work. I don’t believe she ever renounced any of the paintings she made between 1954 and 1961. On the contrary, she was delighted when Ulrich Krempel (at the Sprengel Museum, Hannover) started taking a serious interest in her work of that time. She wrote that the energy and chaos that went into the picture was a way of dealing with the “fear of insanity”. Do you think that was the case? Niki was all too perceptive and unflinchingly courageous, and she often pushed herself into situations where she was teetering on the brink. So it seems likely to me that the intense practice of her art gave her some kind of equilibrium. But that’s a pathetic way of approaching her work. Niki mentioned that she liked the abstract work in The New American Painting show in Paris in 1959. Did the featured artists have much of an influence? The show, curated by Frank O’Hara for MoMA, included work by Pollock, de Kooning, Franz Kline and others. It was Niki’s exposure to new American painting and she was enthusiastic, but I don’t believe it had much effect on her way of working or thinking about art. (She no doubt knew much of the work from reproductions.) The strongest impression on her work actually came from Sienese art. In 1958 we had rented a house in Elba, and there Niki had another terrible hyperthyroid attack. A doctor advised that we move to an altitude of 3,500 ft, so we found a place in the late summer near Siena. We had a marvellous time driving around the area and discovering the museums in the small towns. She loved seeing Bartolo di Fredi’s The Adoration of the Magi c.1380, now in the Pinacoteca Nazionale in Siena. She also liked Ambrogio and Piero Lorenzetti and Simone Martini, and no doubt Sassetta, although there was less of him to see. She loved the depiction of space and depth in these works and their exceptional use of colour, and felt that she was recognising kindred spirits. Of course it wasn’t merely the technical aspect that appealed to her: the intensity, the high seriousness, the way a subject could be invested with overwhelming and also intimate power filled her with a respect she had until then reserved for Gaudí and Matisse. Niki’s work changed when she started doing the Shooting Paintings. Why do you think this was so? When our marriage was over and Niki left, she wanted no allowance from me, although I did promise to buy a certain number of paintings from her for a couple of years. Jean Tinguely refused to give her money: he insisted that she had to earn her living from her art. This was a completely new situation for her, since I’d supported her until then. She spent six months in a kind of aesthetic wilderness, from which she emerged with the project and ultimately the success of the Shooting Paintings. Looking back on her work, how do you see it now? I’ve been a fan of Niki’s since her first collages. One thing that strikes me about her work is its extraordinary consistency, its unity. 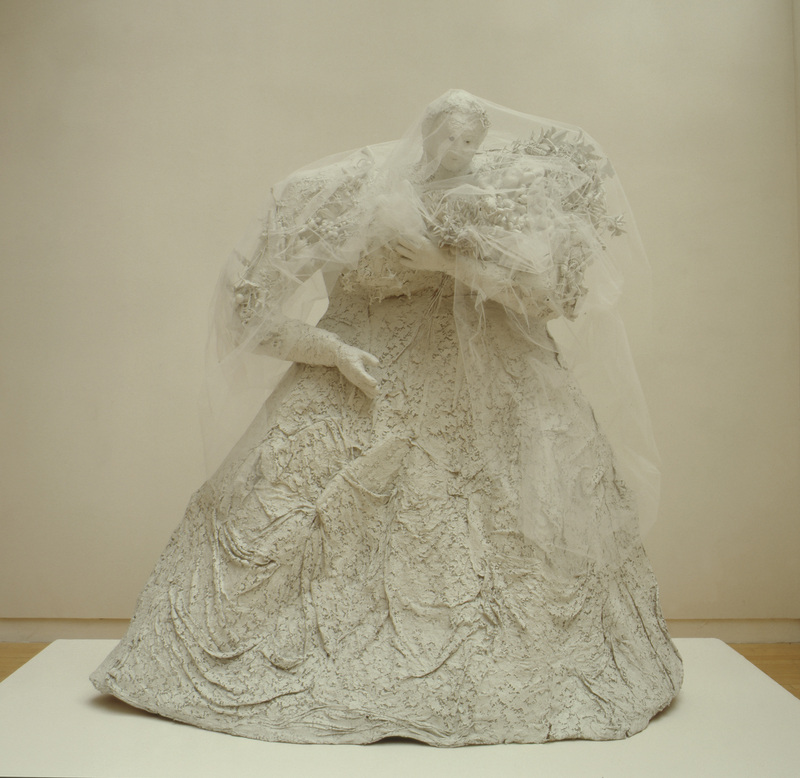 In retrospective shows, every stage in her development seems to issue from what has preceded it – even the Shooting Paintings, and much more obviously the cathedrals and Nanas and her glorious final sculptures. The forms she used later can all be found in her early paintings, even when their effect differs hugely according to the intention of the work. The big animal sculptures she did at the end of her life were there in embryonic form in her early paintings. The surprising thing about her work is not the differences over the years, but the similarities.